Did you know that there are at least a dozen Phalaenopsis (Moth Orchid) species that are miniatures? Tiny Phalaenopsis appendiculata is a twig epiphyte--it grows on the skinny branches of rainforest trees in Malaysia, where it is endemic. 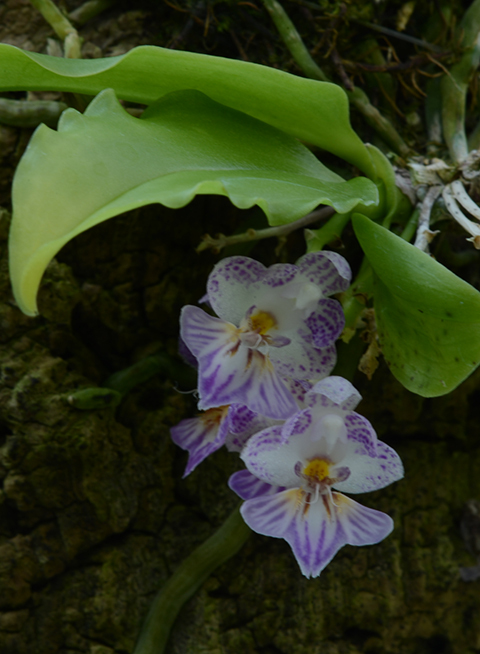 Though it appears huge in the photo, our Phalaenopsis appendiculata is actually about 2" x 2". I have watched with increasing admiration as it has produced flowers in succession, month after month. But what I find totally charming are those undulating leaf margins. High humidity and hot temperatures are the key to growing Phalaenopsis appendiculata. Although we grow ours slightly drier and cooler, Dr. Tsuneo Ikedo, on his fantastic Phalaenopsis Species website, recommends 85% relative humidity; 73º at night and 89.6º as the daytime high temperature. That's lowland tropical.